Area/description: Red Lake is a picturesque lake just off Highway 88. 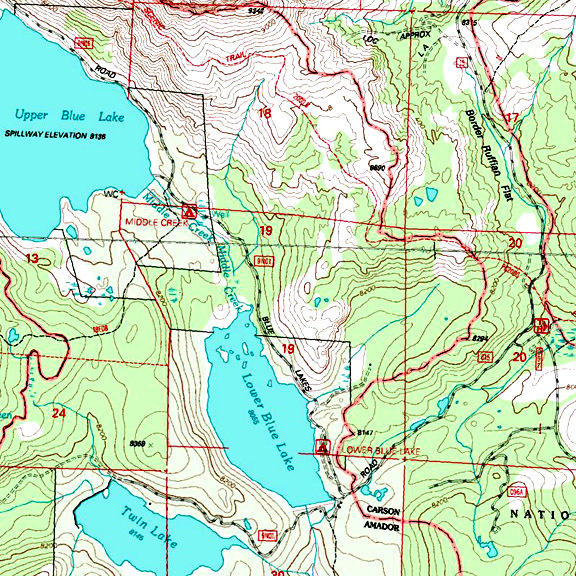 Nearest campground: Woods Lake Campground west of Carson Pass is the closest campground, or you may take the Blue Lakes Road to the campgrounds there. Boating: Motors are not allowed. Stocking information: 6,000 small rainbows along with cutthroat and brook trout fingerlings. Directions: From Highway 395, turn left on Highway 89 and drive _____miles to Markleeville. Continue on Highway 89 to the junction with Highway 88 in Woodford, California. Turn left (west) and drive __ miles to Red Lake turn-off. Region: Area/description: A small pond-sized lake with small fish. From Highway 395 in Minden, Nevada, turn west on Highway 88 and drive 21 miles to Blue Lakes Road, which is approximately two miles west of the Luther Pass Junction. Turn left on Blue Lakes Road and …. Contacts: PG&E Buildings and Land Services, (916) 386-5164, Carson Ranger District, (775) 882-2766. Boating: A boat launches are provided on both lakes. Stocking information: 12,000 rainbows from 10-12-inches, along with 10,000 rainbow fingerlings for the upper lake and 15,000 brook trout fingerlings for the lower lake. Number of sites: 10 sites at Upper Blue Lake and 15 sites at the expansion area, which is restricted to tents only. RV sites: Yes RV’s up to: 25-feet No Hook-ups: Garbage: containers Pack-it-out! Additional information: Some facilities are wheel-chair accessible. Pets must be kept on a leash. Please note that the dates and prices above are subject to change and reflect 2008 data. If listed, the campground opening dates are approximate due to weather conditions. 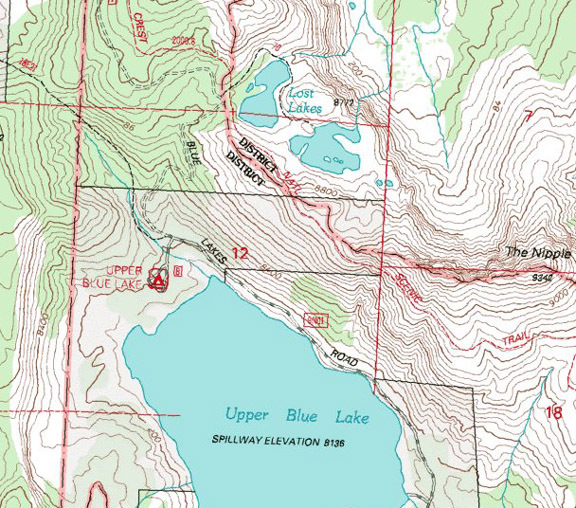 Area: Blue Lakes Road, which lies a few miles east of Luther Pass off Highway 88. 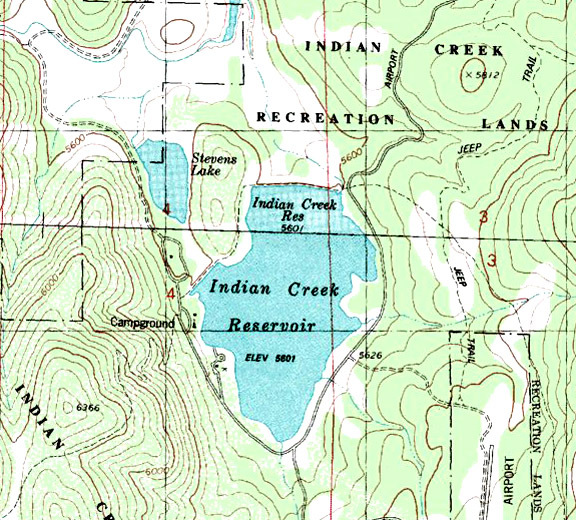 The campground is located on Middle Creek, which joins Upper and Lower Blue Lakes. RV sites: Yes RV’s up to: Hook-ups: Garbage: containers Pack-it-out! Additional information: Pets must be kept on a leash. Please note that the dates and prices above are subject to change and reflect 2008 data. If listed, the campground opening dates are approximate due to weather conditions. Directions: From Highway 395, turn left on Highway 89 and drive _____miles to Markleeville. Continue on Highway 89 to the junction with Highway 88 in Woodford, California. Turn left (west) and drive __ miles to Blue Lakes Road, which is approximately two miles west of the Luther Pass Junction. Turn left on Blue Lakes Road and drive 12 miles to a junction at the southern end of the lake. Turn right and drive 1.5 miles to the Middle Creek Campground. The expansion area camping is 200 yards further. From Highway 395 in Minden, Nevada, turn west on Highway 88 and drive 21 miles to Blue Lakes Road, which is approximately two miles west of the Luther Pass Junction. Turn left on Blue Lakes Road and drive 12 miles to a junction at the southern end of the lake. Turn right and drive 1.5 miles to the Middle Creek Campground. The expansion area camping is 200 yards further. Directions: From Highway 395, turn left on Highway 89 and drive _____miles to Markleeville. Continue on Highway 89 to the junction with Highway 88 in Woodford, California. 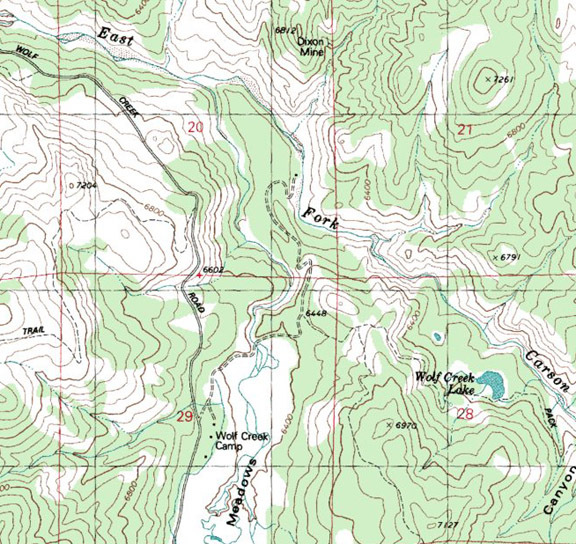 Turn left (west) and drive __ miles to Blue Lakes Road, which is approximately two miles west of the Luther Pass Junction. 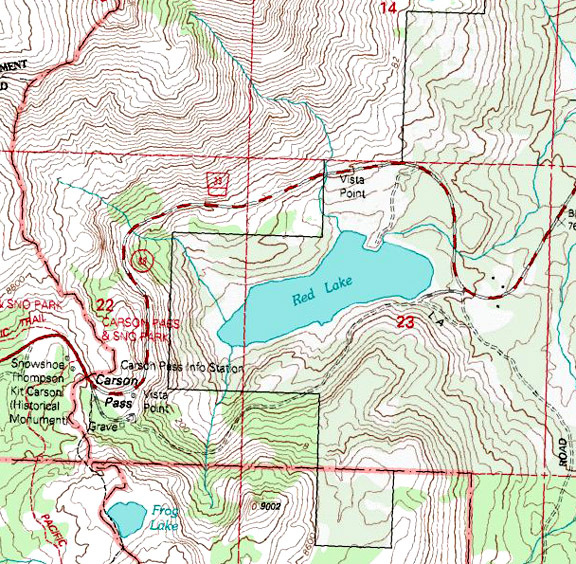 Turn left on Blue Lakes Road and drive 12 miles to a junction at the southern end of Lower Blue Lake. Turn right to the campground. From Highway 395 in Minden, Nevada, turn west on Highway 88 and drive 21 miles to Blue Lakes Road, which is approximately two miles west of the Luther Pass Junction. 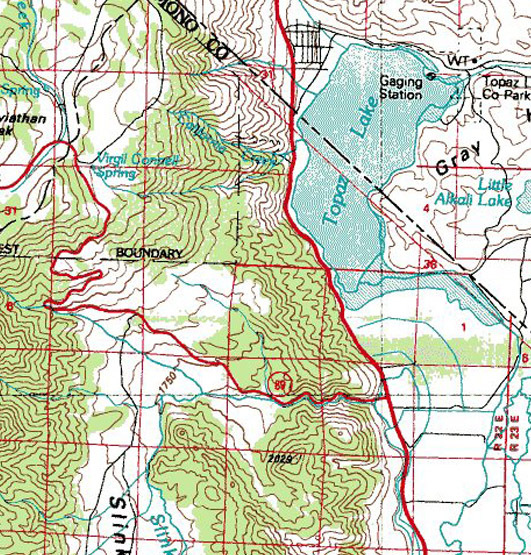 Turn left on Blue Lakes Road and drive 12 miles to a junction at the southern end of Lower Blue Lake. Turn right to the campground. Additional information: The East Fork of the Carson River from Hangman's Bridge to the Nevada border is designated as a Wild Trout section along its twelve my course to the border. Although the size and catch rates have been disappointing to some, it nonetheless offers a chance at catching wild fish. Bank fishing access is from the bridge downstream or a trail from the Indian Creek Recreation Area leads to the river. Access from the south side of Hangman's Bridge is through private property that so far has not been restricted. Directions: From Highway 395, turn left at the junction with Highway 89 and proceed over Monitor Pass to the junction with Highway 4. 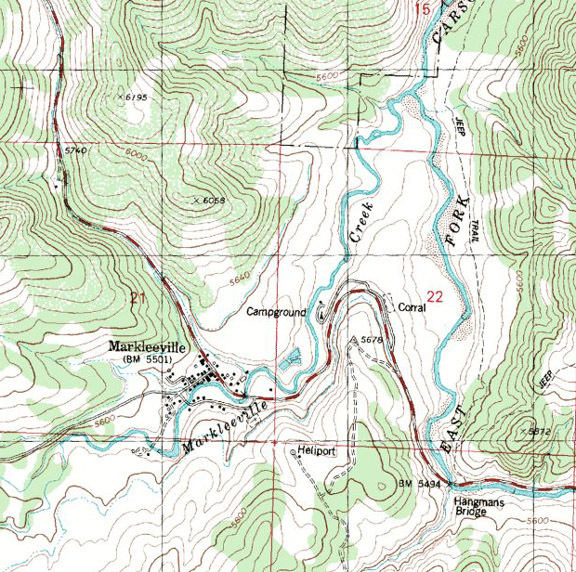 Turn left on Highway 4 to access the upper portion of the East Fork, or continue on Highway 89 to Markleeville and the junction with Highway 88, where the West Fork joins the East Fork. Fee: $14. Extra vehicle: $5 Day Use: $5. Nearby fishing: The campground is located on Markleeville Creek, which holds small trout. The East and West Forks of the Carson River, Silver Creek and Wolf Creek offer better fishing opportunities. Additional information: The access road to the campground is paved, although the campground road is not. Pets must be kept on a leash. Please note that the dates and prices above are subject to change and reflect 2008 data. If listed, the campground opening dates are approximate due to weather conditions. Directions: From Highway 395, turn north on Highway 89. Proceed to the town of Markleeville. The campground is ½ mile south of town. Features: The state park has a pool complex with a hot pool and a swimming pool fed by hot springs, along with a campground, picnic area and hiking trails. Hot Springs Creek is stocked with trout providing there is sufficient water flow. Season: Open-year-round. The facilities are closed during severe storms, and seasonal hours and days of operation change during the off-season months so it is best to call in advance. During the winter months, the pool is closed on Wednesdays. The pool facilities are closed for two weeks in September for cleaning and maintenance. Facilities: A small grocery store is four miles away. Additional information: Pets must be kept on a leash. Please note that the dates and prices above are subject to change and reflect 2008 data. For a reservable campsite, phone toll free at 877-444-7275. For on-line reservations: www.reserveamerica.com. Directions: From Markleeville take the Hot Springs Road four miles to the park. Setting: The park offers a wooded setting. Additional information: A camp host is on site. Pets must be kept on a leash. Please note that the dates and prices below are subject to change and reflect 2007 data. If listed, the campground opening dates are approximate due to weather conditions. Directions: From Highway 395, turn left on Highway 89 and drive _____miles to Markleeville. Continue another _____ miles to the campground entrance on the left side of the road. Description: Indian Creek Recreation Reservoir is a popular destination for Nevada residents, especially on weekends. In addition to the campground, the developed BLM recreation site offers an environmental study area and numerous hiking trails to Curtz Lake, to the East Fork Carson River and to the Carson River. Favorite lures or bait: Trolling is by far the most popular fishing method. The reservoir is not known for good fishing throughout the season. Directions: : From Highway 395, turn left on Highway 89 and drive _____miles to Markleeville. Continue another four miles to Airport Road and drive another four miles to Indian Creek Reservoir. Veer left and continue to the campground on the west side of the lake. Setting: Surrounded by ponderosa and Jeffrey pines on the west shore of Indian Creek Reservoir, the campground is a first-come, first served campground with paved loop roads and a facility for hot showers. Fee: $20 and double sites are $32. Walk-in sites range from $14 to $20. Add $5 for each additional vehicle. Boat Launch: The maximum speed limit on the lake is 5 mph. Nearby fishing: The 160 acre lake offers fair trout fishing. Nearby is the Carson River. Additional information: Pets must be kept on a leash. Please note that the dates and prices above are subject to change and reflect 2007 data. If listed, the campground opening dates are approximate due to weather conditions. Dead and down wood may be gathered from BLM lands for campfires. Directions: From Highway 395, turn left on Highway 89 and drive _____miles to Markleeville. Continue another four miles to Airport Road and drive another four miles to Indian Creek Reservoir. Veer left and continue to the campground on the west side of the lake. Description: Coursing out of the Carson-Iceberg Wilderness, the East Fork plunges down through a steep canyon to enter Wolf Creek Meadows. This is the furthermost section of the river accessed by vehicle. Good fishing can be experienced all along Wolf Creek Road, as well as along Wolf Creek. From Wolf Creek to Carson Falls, which is approximately fourteen miles, the river is classified as a Wild Trout stream. Above the falls the stream and its tributaries are closed to protect Lahontan cutthroats. Species: Stocked rainbows along the access road from Highway 4 to Wolf Meadows, which is approximately six miles from the Highway 4 turn-off. Wolf Creek beyond the meadows has wild trout populations. Contacts: Alpine Fly Fishing, 14841 Highway 89, Markleeville, CA 96120, (530) 542-0759 0r (530) 694-2562. Nearest campground: Primitive camping spots are available in the area, or you may camp at Silver Creek Campground on Highway 4. Tips: Bring mosquito repellant as well as mosquito head netting tucked in your vest if the fishing is good but the vector attacks are in full force. Additional information: At Wolf Meadows the dirt road forks. 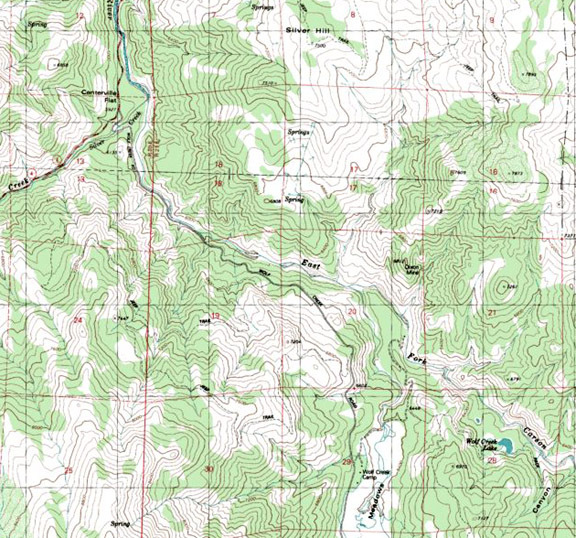 The left fork is a 4x4 ranch road that leads to Dixon Mine. This rough road only goes about a mile and dead-ends on a bluff over-looking the East Fork. Follow the right fork through the meadow section to a primitive campground. Anglers willing to hike up Wolf Creek will be rewarded with small, but wild rainbows. Directions: From Highway 395, turn left at the junction with Highway 89 and proceed over Monitor Pass to the junction with Highway 4. Turn left on Highway 4 and drive ___ miles to the Wolf Creek Road. Turn left on Wolf Creek Road to Wolf Creek Meadows. The road is paved for ___ miles and changes to a dirt and gravel road. Description: This tiny, five-mile creek is shrouded in brush, willow brambles and granite rocks and boulders, which provide small pocket water. Casting is most difficult along the creek for its entire course. Just penetrating the thicket to poke and probe makes this a challenging little creek. For that reason most anglers pass by heading for larger water. It is, however, generously stocked particularly above or below bridge crossings. Scratches, hats knocked off, fly line snags and the difficulty of bringing in a fish are certainly worthwhile when you stick a dark and wild rainbow over ten inches. Additional information: Pets must be kept on a leash. Please note that the dates and prices below are subject to change and reflect 2007 data. If listed, the campground opening dates are approximate due to weather conditions. 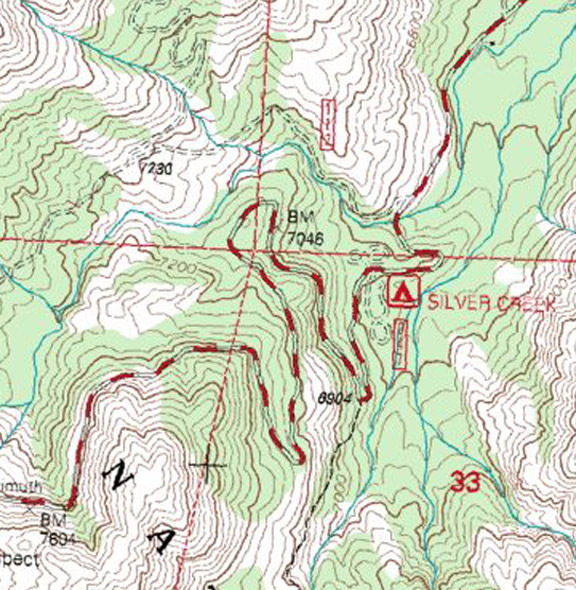 Directions: From Highway 395, turn left at the junction with Highway 89 and proceed to the junction with Highway 4. Turn west on Highway 4 and drive six miles to the Silver Creek Campground entrance. Description of Kinney Reservoir: Kinney Reservoir sits right along Highway 4 and offers good bank fishing for stocked rainbows averaging ten inches. The reservoir is also home to some small brook trout. 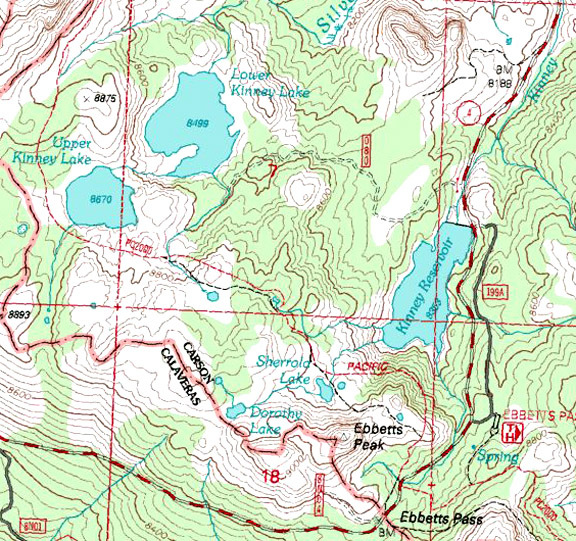 Kinney Lakes are a short distance away. Stocking information: Kinney Reservoir is stocked annually with 3,000 rainbows and 2,000 fingerling brook trout. Upper and Lower Kinney Lakes, a short hike away, are planted with fingerlings each year. Area: Yes, I slipped over the pass, and it is no longer the “Eastern Slopes”, but how could I not squeeze this one in when it is so close to Ebbetts Pass! Setting: The campsites are located in a timbered setting along the banks of the North Fork of the Mokelumne River near Highlands Lake. RV sites: Yes RV’s up to: 16-feet Trailers are not recommended No Hook-ups Garbage: Pack-it-out! Directions: From Highway 395, turn north on Highway 89. Drive ____ miles to the junction with Highway 4. Turn left (west) and drive ______miles to Ebbetts Pass. Continue 1.5 miles west over the pass and turn left on Highland Lakes Road. Drive two miles to the campground entrance on the right. Road condition: Paved Note: Highway 4 opening across Ebbetts Pass typically happens in late April or early May; however, after a heavy snow-pack year, the road may not be cleared until late May. During heavy snow years, Highland Lakes Road will not be open until late May or June. Call ahead for early season arrival. Trailers are not recommended. Day hikes to fishing: Highland Creek is the outlet to Upper Highland Lake, which eventually works its way down the mountain five miles to Spicer Reservoir. It can be tough hiking, but fishing is good for pan-sized rainbows. Region: Ebbetts Pass area Area/description: Situated in a high altitude alpine setting, Highland Lakes offer fishing in headwater lakes, as well as in the small tributary creek, Highland Creek. Heading to the lakes from Highway 4, the road passes by the North Fork Mokelumne River, which good fishing for those willing to prowl and work a lot of water. Lake size: Depth: Species: Stocked fingerling brook trout and carry-over populations. Boating: These two small lakes are best suited for tubers, but keep in mind that the area is frequently wind swept. Stocking information: 500 fingerlings in the upper lake and 1500 fingerlings in the lower lake. Additional information: The fishing in these lakes can best be described as “fair” fishing for dinks. Nearby fishing: The meadow section of the North Fork Mokelumne River that parallels Highland Lakes Road offers good fishing for fly anglers who keep probing and moving. Directions: From Highway 395, turn north on Highway 89. Drive ____ miles to the junction with Highway 4. Turn left (west) and drive ______miles to Ebbetts Pass. Continue 1.5 miles west over the pass and turn left on Highland Lakes Road. Drive 7.5 miles to the campground. Setting: An alpine forest setting, the campground is surrounded by high peaks and adjacent to the lakes. Road conditions: The roads are rough and not recommended for camping trailers. RV sites: Yes RV’s up to: 16-feet No Hook-ups: Garbage: Pack-it-out! Additional information: Limited camping is available for equestrians with horse trailers in the lower campground. Pets must be kept on a leash. Please note that the dates and prices below are subject to change and reflect 2008 data. If listed, the campground opening dates are approximate due to weather conditions. Directions: From Highway 395, turn north on Highway 89. Drive ____ miles to the junction with Highway 4. Turn left (west) and drive ______miles to Ebbetts Pass. Continue 1.5 miles west over the pass and turn left on Highland Lakes Road. Drive 7.5 miles to the campground entrance on the right. Boating: Gasoline motors are prohibited, but car top prams with electric motors are allowed. Most anglers use float tubes and pontoon kick-boats. Launching is primitive from the parking lot down an access road to the water. Fishing season: General fishing season: Opens last Saturday in April and closes on the last Sunday in October. Tips: A quiet float tube and a black Woolly Bugger is the best way to start. But don’t look for solitude. This little lake can become mighty crowded with tubers until the blustery conditions of fall arrive. Fishing restrictions: (Review recent regulations.) Artificial lures and flies, barbless hooks and catch-and-release. The lake is only open Friday through Sunday. Favorite fly patterns: Standard stillwater patterns such as Woolly Buggers, Green Matukas, Denny Rickard’s Seal Buggers and tried-and-true nymphs that work on Bridgeport Reservoir and Crowley Lake work just as well here. Additional information: The DFG uses the lake as a rearing lake for the endangered Lahontan Cutthroat trout, which have been hybridized in many lakes in the region. Eggs are gathered and sent to hatcheries at Hot Creek and Mount Shasta. Many of these hatched fingerlings return to the East Fork Carson River. 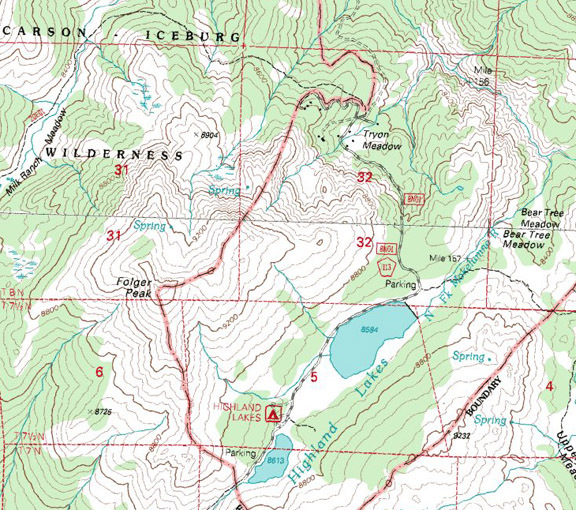 Directions: From Highway 395, turn left at the junction with Highway 89 and proceed over Monitor Pass eight miles to an un-marked dirt access road to the lake parking lot. The lake is approximately four miles from the junction with Highway 4. This side trip loop explores the east slope offerings of the West and East Fork of the Carson River, as well as many alpine lakes and reservoirs surrounding the community of Markleeville. 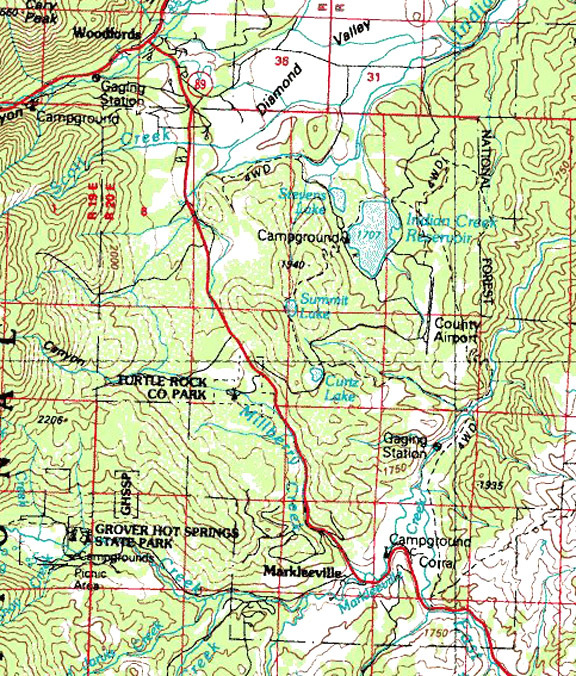 An additional feature is Grover Hot Springs State Park just a few miles east of Markleeville. 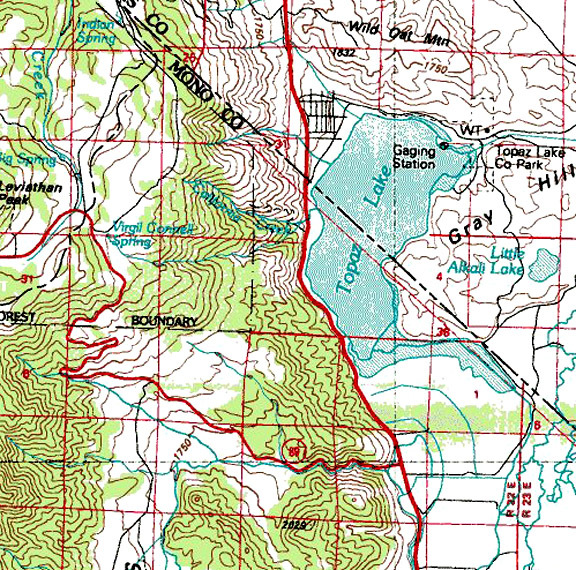 A few miles short of Topaz Lake and the border with Nevada, Highway 395 intersects with Highway 89, which winds up and over Monitor Pass to the junction with Highway 4. The route to the junction with Highway 4 is approximately ____ miles. 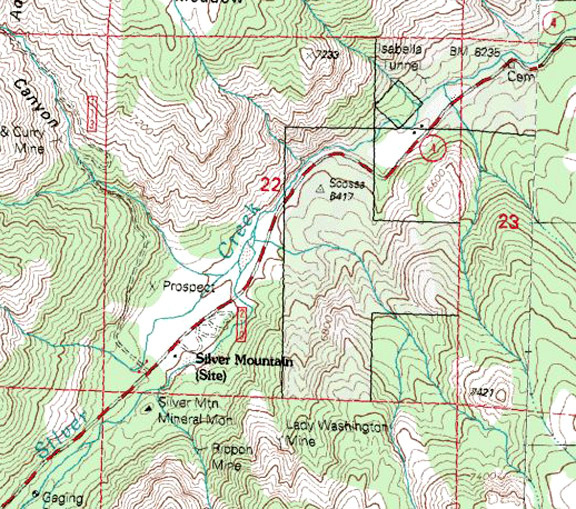 The area along Highway 4 is one of our east slope targeted destination, as it covers the East Fork Carson River. Many beautiful campgrounds and crystal clear waters await anglers eager to fish the East Fork of the Carson River, Silver Creek, and the Highland Lakes. Highway 4 leads westerly to Stockton, or when you have sampled the offerings in this area, you may return to Highway 89 in a northerly route until Highway 89 meets Highway 88. Highway 88 winds its way west to Carson Pass or northeast to Minden, Nevada. Along the way travelers may sample the West Fork of the Carson River, Red Lake, as well as Upper and Lower Blue Lake. We will begin our excursion on Highway 4 at its junction with Highway 89. For travelers heading to Reno or Carson City and points north on Highway 395, Topaz Lake is just a few miles away. Please note that I have combined fishing and camping notations together for each of the highway side-trips. But first let’s not forget that Highway 89 passes Heenan Lake, a much publicized trophy trout lake. 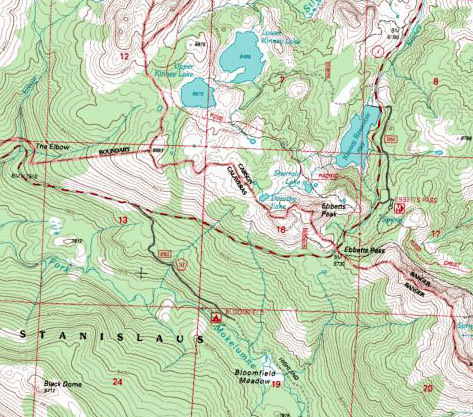 I'll cover Heenan Lake first, than fishing and camping along Highway 4 to Ebbetts Pass. Than I will return to the junction of Highway 4 and Highway 89 and cover recreational information for the Markleeville area to Woodford at the junction of Highway 89 and 88. From this junction we will explore the West Fork of the Carson River along Highway 88 all the way to Carson Pass. Near the pass we will explore Red Lake, Lost Lake and the Blue Lakes.